How big is big enough for you? 5-inch? 7-inch or 10.1? 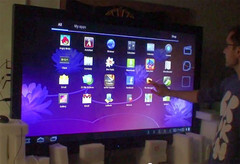 We even have reports of a 23-inch Android tablet being developed. But this one takes the cake. 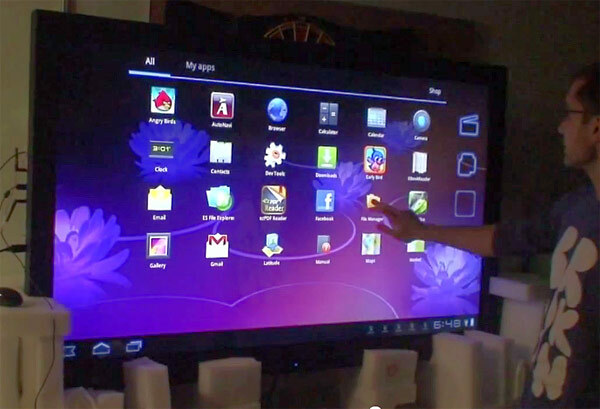 Istanbul based startup tech firm Ardic Technology has designed what could be world’s largest Android tablet. This monster measures a whopping 65-inch diagonally and runs Honeycomb with full touch – screen support. In fact we were amazed at the response the screen has to touch in the demo embedded below. The current model currently offers just two sensors however the company has promised a four-sensor unit in the near future which will bring with it multi-touch support. The tablet is powered by a Tegra 2 SoC processor and 1GB of RAM. It also offers 16GB internal flash memory dual cameras. Ardic throws in support for external storage through microSD card slot and 3G support. With the HDMI Aardic might just create another record of world’s first instance of playing on a smaller second screen through HDMI! That’s not all, The Inquisitr says it has a dock as well that enables instant connectivity to the OEM TV with HDMI support for video and audio and USB support for touch input. Although the tablet doesnot support Wi-Fi right now (which by the way looks like the only wireless way practically possible for this device to connect to the net) – Ardic promises to incorporate it in the future. Our question is – is it a tablet at all? And will it replace your Internet TV?